The all new Honda Passport SUV takes shape at the Talladega County plant. For the second consecutive year, the Honda facility in Lincoln built a record number of Pilot SUVs in 2018. In early December, the plant also started mass production of the 2019 Honda Passport, a new two-row, midsize rugged SUV that will go on sale at dealerships early this year. HMA Vice President Mike Oatridge says the Passport is based on Honda’s Global Light Truck platform and shares much of its underlying structure with the three-row Pilot SUV and Ridgeline pickup, including a highly rigid unibody construction. The vehicle is being built exclusively in Alabama. Oatridge says the new Passport will play a critical part in helping Honda meet high demand within the U.S. light truck market. “As we have seen in the market, SUVs are extremely popular and we see an opportunity to expand customer choice with a five-passenger, V6-powered SUV that slots between the Honda CR-V and the Pilot in our lineup,” Oatridge says. Oatridge says the Passport, which debuted at the Los Angeles Auto Show last September, should appeal to buyers seeking a more powerful and rugged five-passenger Honda SUV. The Passport also revives the nameplate of an SUV Honda had available in the 1990s and early 2000s, according to the Alabama Department of Commerce. “It’s more powerful and rugged than the CR-V, and more sporty and personal than the family-focused Pilot,” Oatridge says. The Passport production launch was the fourth new model re-design at HMA in the last four years — an unprecedented move for any Honda manufacturing facility in North America. In addition to the Passport, HMA also produces several other award-winning Honda models, including the Odyssey, Pilot, Ridgeline and V-6 engines. Preliminary numbers show HMA built a total of 356,569 minivans, SUVs, pickup trucks and V-6 engines in 2018, including 189,964 Pilot SUVs, 120,427 Odyssey minivans and 46,178 Ridgeline trucks. With more than $2.6 billion in overall capital investment, HMA has approximately 4,500 employees and an annual production capacity of more than 340,000 vehicles and engines. Situated on 1,350 acres about 40 miles east of Birmingham, HMA also launched new logistics space in 2018, representing a total investment of more than $85 million. In addition, the factory is spending $54.8 million to improve welding operations at Line 2, which will add more than 50,000 square feet to the facility by early 2021. The new facilities span nearly 400,000 square feet and allow Honda to better streamline logistical operations. Oatridge says the expansion will improve overall parts delivery, quality and organization across all HMA production lines. When combined with 2017 investments, HMA has added more than 425,000 square feet to its production operations with an investment total of approximately $150 million. The Talladega County plant has seen a total investment of $2.6 billion since it began operations. HMA operations currently include steel and aluminum blanking, stamping, welding, painting, plastic injection molding, aluminum casting and machining, ferrous machining, vehicle sub-assembly, body and engine assembly, vehicle testing and quality assurance. It is the first Honda factory to have both engine die-casting and machining and vehicle assembly under one roof. Alabama’s automotive industry exploded in 1993 when Mercedes-Benz announced plans to launch a U.S. assembly plant in Vance. Honda, Hyundai, Toyota and multiple automotive suppliers quickly followed suit, helping Alabama become a critical production hub for the automotive industry. The Alabama Department of Commerce reports Alabama automakers produced a combined 1 million cars and light trucks in 2017, while Honda, Toyota and Hyundai also made about 1.7 million engines. Total employment includes more than 40,000 workers, about half of whom work for Alabama’s growing automotive supplier network of over 200 companies. Oatridge says that 2019 marks nearly two decades since HMA started production on November 14, 2001, in Talladega County. 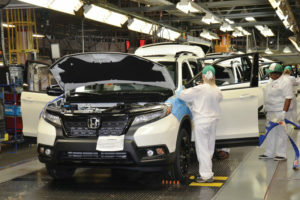 The plant is part of a larger global corporation that provides a full line of Honda vehicles, including the Fit, Civic, Insight, Accord and Clarity series passenger cars; the HR-V, CR-V, Passport and Pilot SUVs; the Ridgeline pickup; and the Odyssey minivan. The Japanese company began producing vehicles in America more than 36 years ago and currently has 19 major manufacturing facilities across North America. In 2017, more than 90 percent of all Honda automobiles sold in the U.S. were made in North America using both domestic and globally sourced parts. As demand grows, Oatridge believes HMA will meet the manufacturing requirements of Honda’s expanding product line and beyond. “It is the craftsmanship and dedication of our 4,500 associates which brings to the marketplace the high-quality Honda products that our customers want and need,” he says.